After Abraham Lincoln returned from taking a flatboat to New Orleans, he clerked in New Salem for Denton Offutt, the boat's owner. A year later he and William Berry bought an interest in a general store from James and Rowan Herndon. 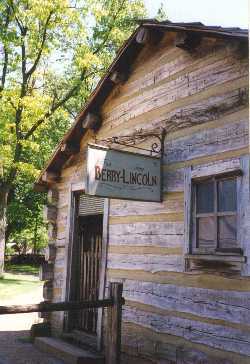 Apparently the business attracted Lincoln for lack of other plans. He described it in his 1860 autobiography, written in the third person: "He studied what he should do -- thought of learning the blacksmith trade -- thought of trying to study law --rather thought he could not succeed at that without a better education. Before long, strangely enough, a man offered to sell, and did sell, to Abraham and another as poor as himself, an old stock of goods, upon credit. They opened as merchants; and he says that was the store."